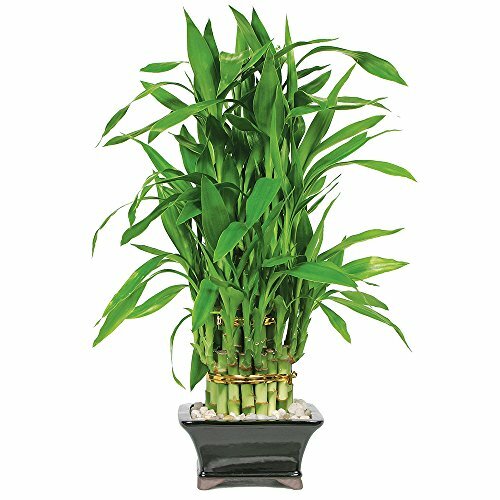 Bring good cheer and luck into your home or office with this live Lucky Bamboo plant. Even if you're not much of a green thumb, you can keep this indoor ornament because it is easy to grow -- just don't let it freeze. When the temperature is above 50 degrees, all you need to do with this low-maintenance bamboo is to move it outdoors. This variant is small so it can make a nice centerpiece for most any table. SPECIES: Bring good cheer and luck into your home or office with this live Lucky Bamboo plant. Even if you're not much of a green thumb, you can keep this indoor ornament because it is easy to grow. SIZE: Your small bonsai comes in a 6" container. AGE: This Lucky Bamboo Pyramid is 3 years old. WARRANTY: Your bonsai tree has been grown in a stare-of-the-art greenhouse under precisely controlled conditions to achieve optimum health. If for any reason you are not completely satisfied with your tree or with our service, please notify us within 30 days of reciept. We will correct the situation to your satisfaction.